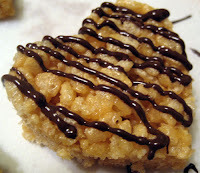 Vegetarian Cookster: Vegan Rice Crispy Treats! 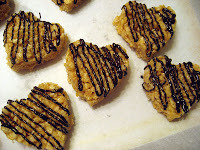 Quick post here, but I wanted to preview part of what I'll be giving my omni fiance tonight during our Valentine celebration... vegan rice crispy treats! But shhhhhh.... I'm not telling him they're vegan. I'm sure he'll figure it out if he happens to offer me one and I accept, but I'm curious to know what he honestly thinks of the taste without throwing the "vegan" word in his face. I must admit, when I first laid eyes on the Vegan Sweets Marshmallows, I was leery . While they try to look like "normal" marshmallows, they fall a bit short; the color is more off-white and their size is somewhere between big and miniature marshmallows. It probably didn't help that I ordered the irregulars because they were cheaper (and I knew I'd just be melting them down anyway). Even when I opened the package last night and sampled one before pouring the rest in the pan of waiting melted Earth Balance, I still was nervous that I had wasted my money because they didn't even taste like traditional marshmallows when eaten alone. UPDATE 2/16/08: These treats passed the omni taste test! My hubby-to-be had no clue these weren't "regular" rice crispy treats. Rice crispy treats are one of his favs. He told me these were very good... and then I did the big reveal that they're vegan! :) Yay! It's been too long since I've had one of these...adorable! Extra points for making them in heart shapes too! I have yet to try any of the vegan marshmallows. I can't get them locally at all, guess I need to order them online. The end result certainly looks worth it! I'm SURE it passed the omni test, just judging by the looks of those delectable little treats! Yeah, and why do marshmallows have to be non-vegetarian anyway? I wish the manufacturers would start using agar or cornstarch. Those look so yummy!